What better way to celebrate but to create special little gifts to give through out the year. Today I am sharing how to upscale a candle jar using Colorbox Embossing Powders and the Bible Clear Stamp Set. 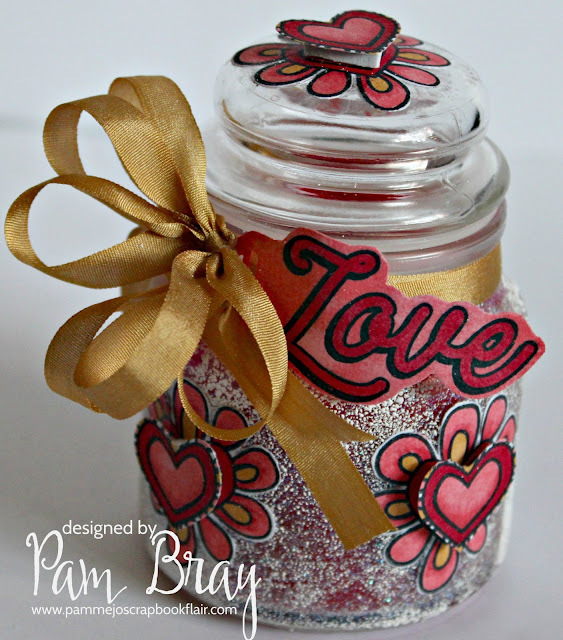 Begin you embossed candle jar by removing the label on the jar. Apply ColorBox Top Boss Watermark ink to bottom of candle jar. Add Color Box Opalescent Embossing Powder to top of watermark ink. Repeat with ColorBox White Embossing Powder. Brush some of the powder off before heart setting with embossing gun. Stamp hearts on white card stock using ColorBox Licorice Permanent Dye Ink. Fussy cut prepared images with scissors. Adhere to prepared embossed jar with glue. Add smaller hearts to top of images with pop dots. Stamp and color "Love" image from the ColorBox Bible Clear Stamp Set to white card stock with ColorBox Licorice Permanent Dye Ink. Color with markers; fussy cut around prepared image with scissors. Tie to prepared candle with ribbon.